One of the ideas underlying our republic is that states have latitude to follow different policies. Therefore, we can see which policies work best, and they can be adopted by other states. It’s a great theory, and no doubt it has worked at times in the past. Today, we have a stark contrast: blue states like California, New York and Illinois are careening toward bankruptcy as a result of the irresponsible policies imposed by their Democratic politicians, while red states like Texas, Utah and the Dakotas are showing the way to prosperity. North Dakota is perhaps the most famous example; it has unemployment only because a few people are between jobs. There are many more jobs than people in North Dakota, so the state eagerly recruits workers from the rest of the country. But South Dakota is, arguably, an even better example of red state success, because it doesn’t have any oil. Despite being oil-free, South Dakota’s unemployment rate is around one-half the national rate. Its economy is booming. Why? When I talk with business leaders around the country who have facilities in South Dakota or who deal with businesses there, they invariably emphasize the quality of South Dakota’s labor force. The phrase “work ethic” comes up again and again. And, of course, South Dakota has a friendly business climate. It hasn’t elected a Democratic governor since 1974. And there isn’t a union in sight. In a sane world, the news media would disseminate information about which states are most successful and what policies they pursue, so that other states can emulate them. That is a pipe dream, of course: we all know that in the world we actually inhabit, our media have an entirely different agenda. The state receives thousands of dollars from the federal government for every child it takes from a family, and in some cases the state gets even more money if the child is Native American. The result is that South Dakota is now removing children at a rate higher than the vast majority of other states in the country. The gist of NPR’s three-part extravaganza is that South Dakota’s Department of Social Services makes money by “kidnapping”–that is the term NPR quotes repeatedly–Indian children, and putting them into foster care for little or no reason. The claim is absurd for a number of reasons, and NPR got its facts wrong over and over. But let’s start with the basics. But wait! Note that South Dakota isn’t particularly green. What about those dark green states? Aren’t they “kidnapping” even more Indian children? NPR’s own map indicates that South Dakota is fifth in the nation in “disproportionality,” with 3.9 times as many Indian children in foster care, pro rata, than the state’s population. So one wonders: why is NPR focusing on South Dakota? What about the states that are ahead of South Dakota in “disproportionality”? 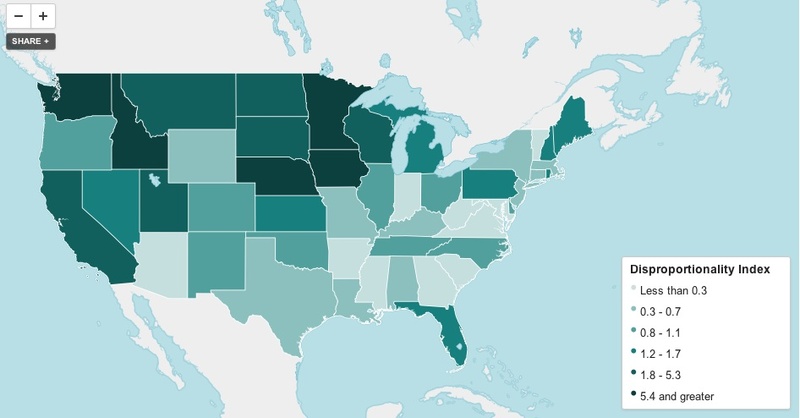 As it happens, the most disproportional state, by a wide margin, is Minnesota. Indians represent just 1.4% of the child population, but 15.7% of those in foster care, for a “disproportionality index” of 11.6, almost three times as high as South Dakota’s! So why isn’t NPR doing a yearlong investigation of Minnesota’s “kidnapping” of Indian children? Silly question: Minnesota is a blue state. Of course, NPR could have defaulted to the number two state on its own “disproportionality index,” at 6.9, a little less than twice South Dakota’s number. But that wouldn’t advance NPR’s agenda: the number two state is blue Washington. All of this makes sense to a liberal journalist. If you are going to undertake a “yearlong investigation” of a state agency, concluding with the sensational claim that financial corruption and “cultural bias” are causing minority children to be “kidnapped” at a disproportional rate, are you going to waste your time in states like Minnesota and Washington? Don’t be silly–those states are run by Democrats, like you! Over the coming days, I will dissect NPR’s three-part hit piece in detail. It manifests a shocking lack of the most basic understanding of 1) the legal status of Indian tribes, and 2) the legal framework within which South Dakota’s child protection agency functions. Beyond that, NPR’s series is shot through with ignorant factual errors. For the moment, however, let’s just pause to consider why NPR thought it necessary to do a hit piece on South Dakota at all.